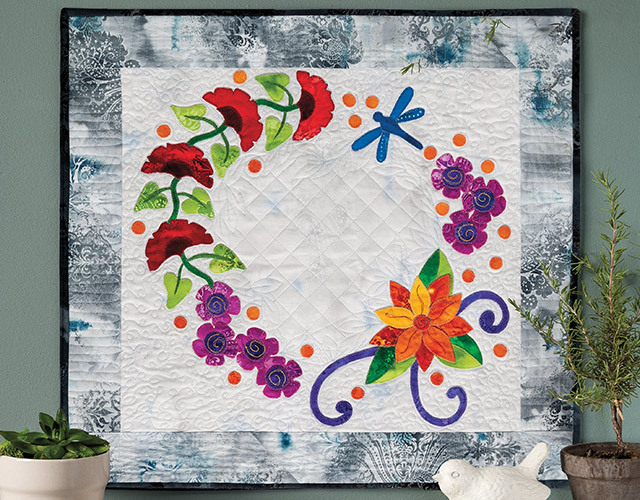 Whether making the exclusive class project, the Summer Wreath Wall Hanging, or using what you've learned to embellish other quilts, clothing or holiday decor, you will come away from this class with a newfound confidence in your machine applique skills. Join quilt expert Annie Smith as she teaches you everything you need to know about machine applique. She'll take you through the process step-by-step with a sampler piece that allows you to practice all of the techniques and become proficient before you begin to create treasured projects. Prepare applique patterns and determine the order of layers. Plan the fabric placement of appliques to maximize light and dark values. Avoid the unwanted "bull's-eye" effect in your design. Choose which machine applique stitch to use and fine tune its look. How to embellish your applique masterpiece with free motion threadplay. Class includes complete step-by-step instructions, patterns and diagrams for the Summer Wreath Wall Hanging. Enjoyed your class will use all the knowledge I have learnt. I have your class scrapy borders also like it. Your classes are excellent. Thank you. Can't wait to get sewing. Gloria Dalgleish. I learned a lot. I have now finished the appliquÃ© , some very interesting butterflies in a variety of sizes, currently I am just looking at the top trying to decide how to quilt it. Once decided the challenge will be to get it quilted, labeled, and bound. Since it definitely looks like a girl's quilt I have purchased some interesting pink fabric for the borders. Now to get to work. Just finished this class. I found the presentation and covering of the material very informative, useful and inspirational. I got over my fair of machine applique. I take a lot of video classes and also watch youtube. I can't believe how good this class was, I bought a accuquilt and am starting to do machine applique. This and the fact that I can watch many times and review areas I may need to see again makes this a great beginners class.